I was travelling back from Santa Barbara to San Diego and the traffic report made it necessary for us to stop and eat in order to wait out some terrible bumper to bumper action (#thanksLA). We ended up at a fun little spot in Westlake Village called StoneHaus. It’s a miniature winery with a tasting room, outdoor seating with fire pits and lots of good food choices. This sandwich was on the menu (with a gluten-free option) and it was quickly decided that we needed to order it. After consuming ever little crumb, it was also decided that I needed to recreate it. Oh how I wish I could eat these everyday. I wish it so hard. Unfortunately dairy is my nemesis and even paleo-friendly bread is consumed on a limited basis in my house. If you can tolerate dairy and non-gluten grains, please make this sandwich. Make it for your friends and family too. They will all have a newfound respect for your excellent sandwich making skills. In a skillet, heat a drizzle of olive oil on medium heat. Add onions and sauté on low until wilted and fragrant. Add balsamic and continue to cook until vinegar is reduced and onions are sweet. Set aside to cool. Toast your GF or paleo bread until golden. (i usually use my broiler since I don’t have a regular toaster). Spread some fig butter on two slices of bread, goat cheese on the other two slices. 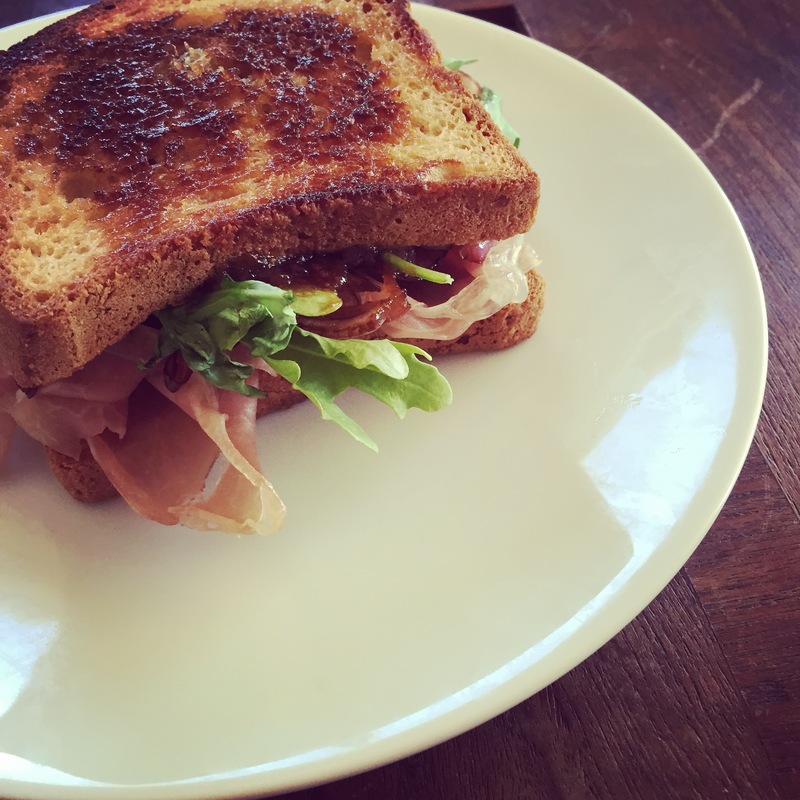 Add the filling ingredients onto two slices (prosciutto, balsamic onions, and arugula). Press fig and cheese slices together to make your sandwich and cut into triangles to serve. Makes 2 sandwiches.